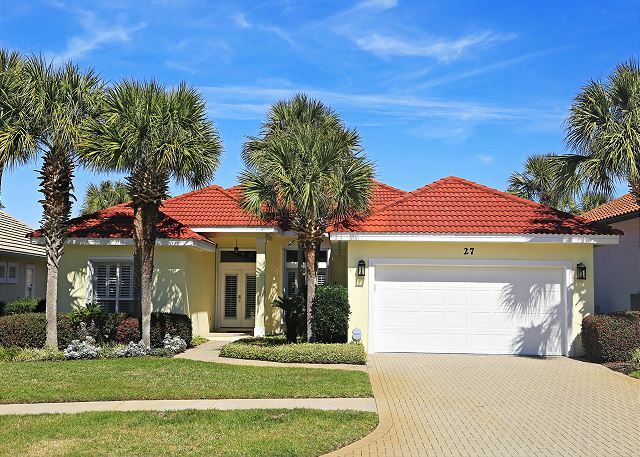 This home was just purchased by The Mathee's as their family beach house. 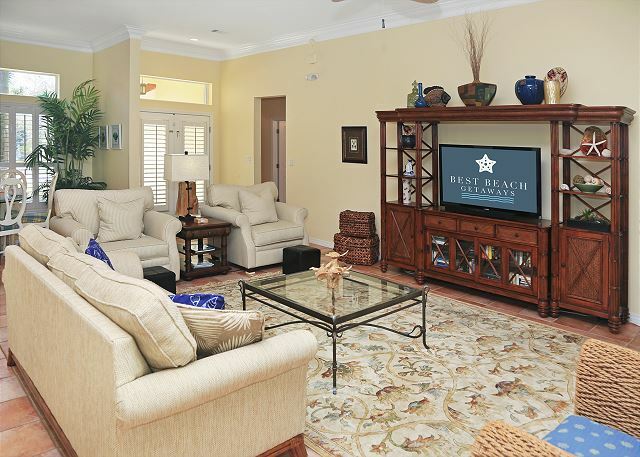 They took time to select the perfect beach home for their family and yours! 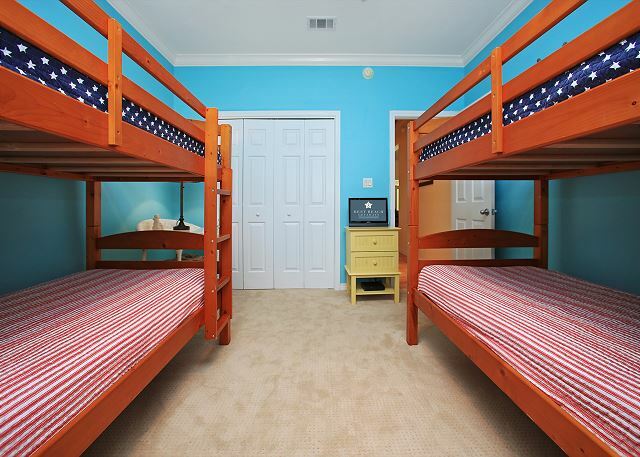 First let’s talk about the bedding sizes: King, Full, 2 Sets of Bunks, and 2 Queen Sleepers. That’s plenty of room for 12! 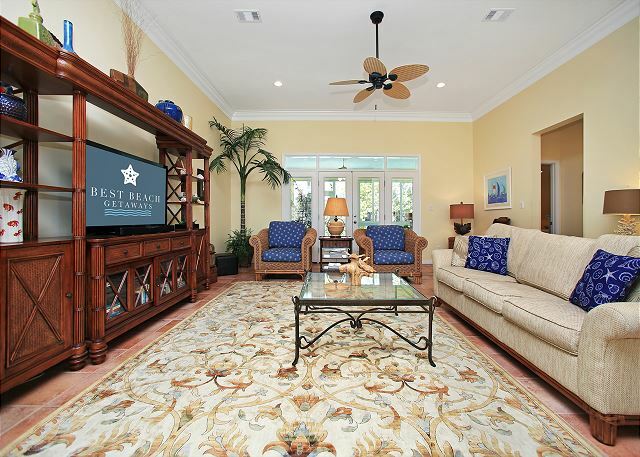 This beautiful beach home is located off the 1st street in Destiny East. Short walk over to the beach access! When you see this home the first thing you’ll notice is the space. 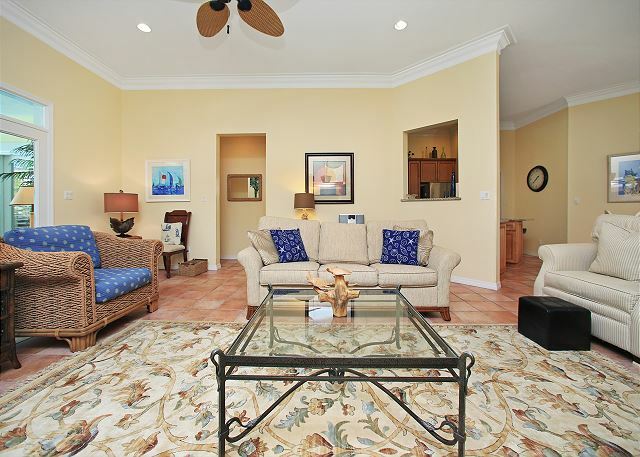 High ceilings and plenty of living room seating for the whole family. The sofa pulls out to be a Queen Sleeper so if you’ve got teens they’ve got a spot just for them. There’s a 50" Flat Screen TV with cable and a DVD player if you’ve brought along some movies for downtime. 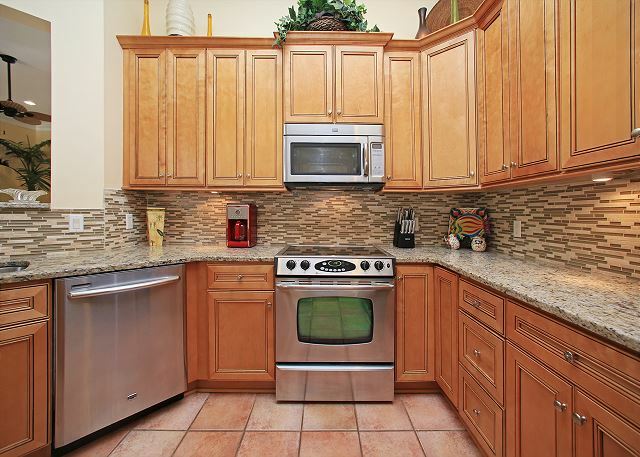 Plus, there’s wireless internet access for everyone to enjoy no matter where they are in the home. So bring along your laptop or your tablet. Just promise us you won’t do any work! 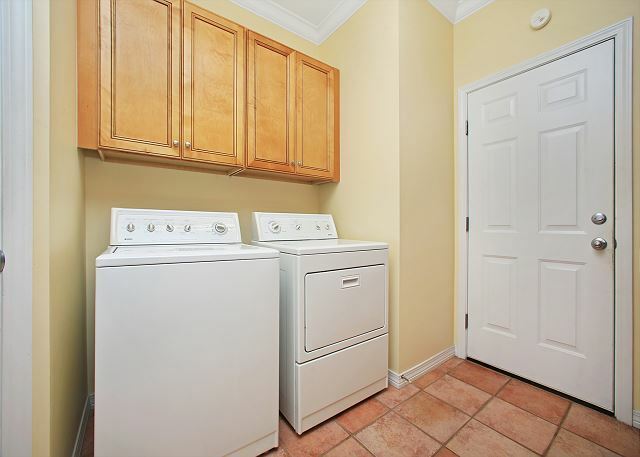 There’s a laundry room with a full size washer and dryer off the kitchen with access to the 2 car garage. 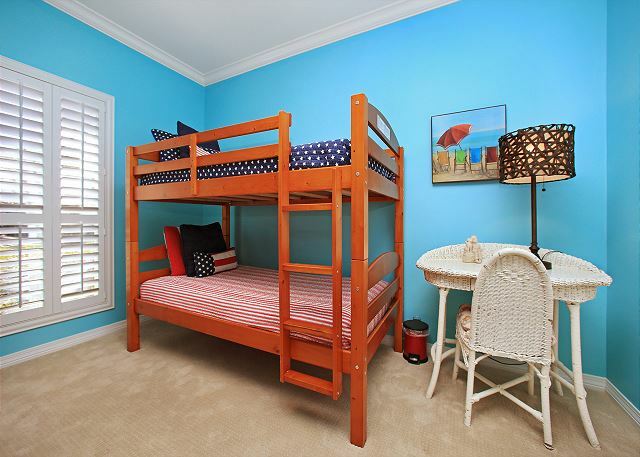 When you head left of the living area there is a hallway that has the kids room with 2 sets of bunks and a 19" TV and DVD player. 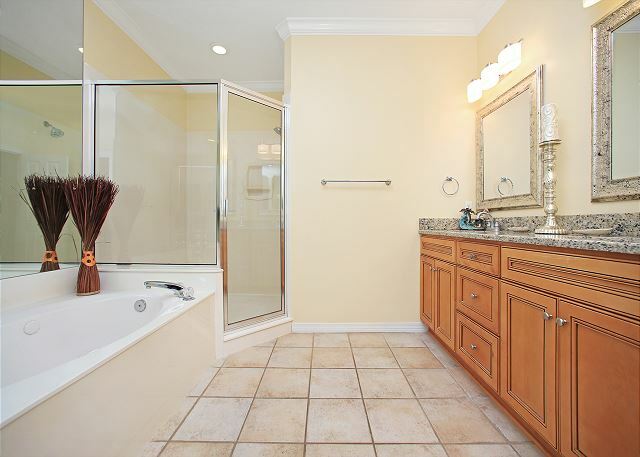 A hall bath with a shower/tub combination. 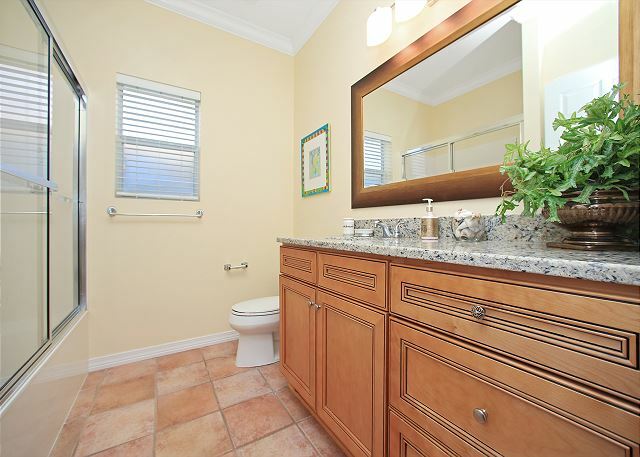 At the other end of that hallway is the 2nd master with the Full bed 32" TV and a private bath with a walk in shower. 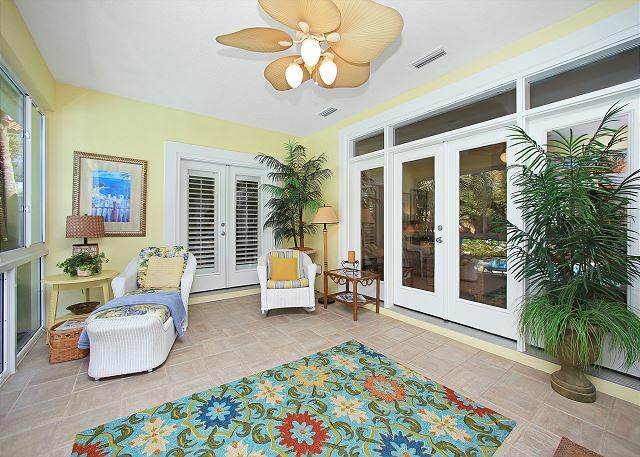 The room also has access to the amazing Florida Room. 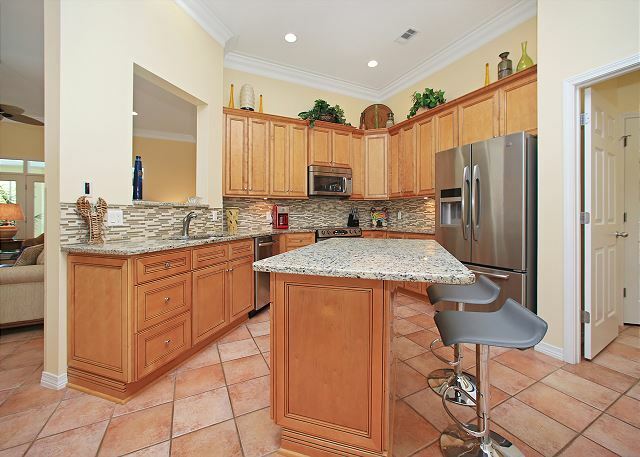 As you step back in the living room and head to the right behind the kitchen there is the large master bedroom with a King bed 40" TV and huge private bath. 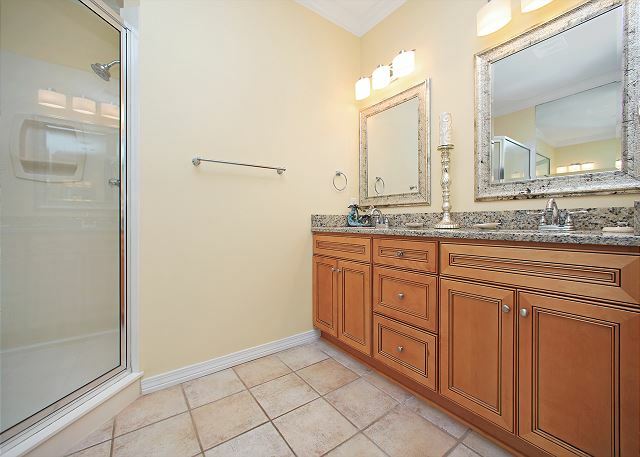 The master bath features a jetted tub and a walk in shower. 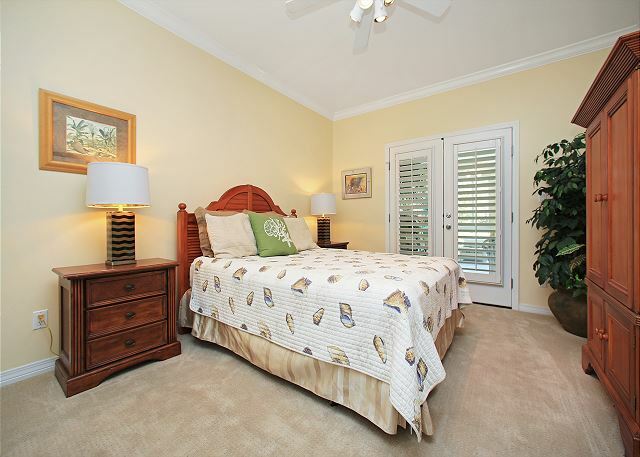 The master bedroom also has access to the Florida room. 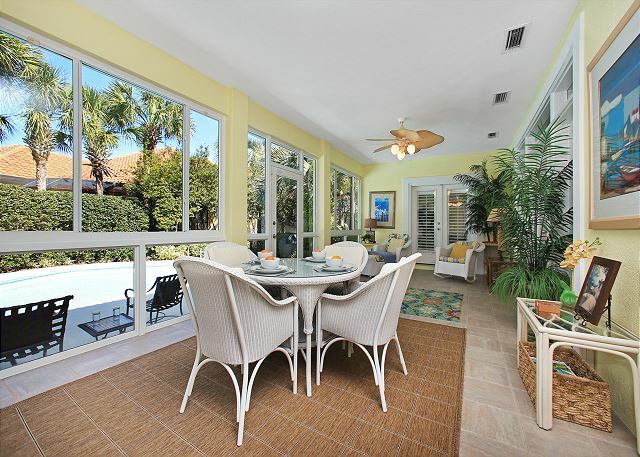 Now let's talk about the Florida room that really makes this home the place you want to spend your vacation. 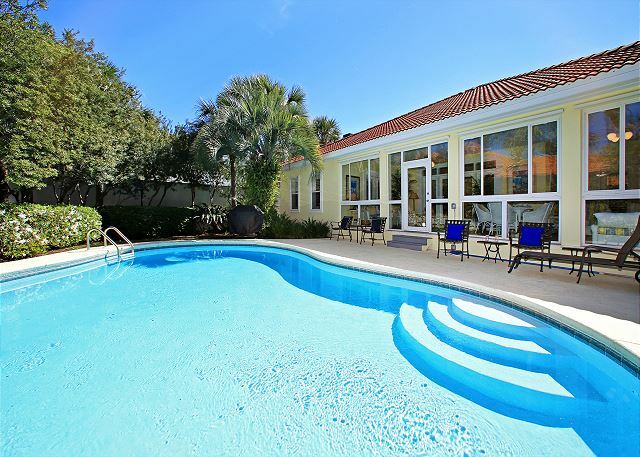 It is huge, overlooks the pool and has it's own AC system. 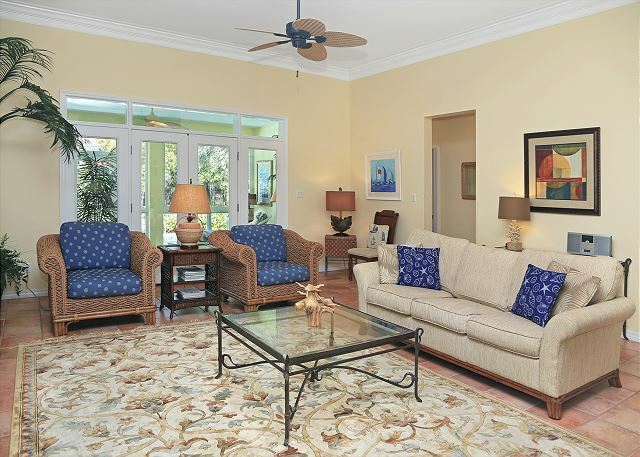 In this space, there is a sofa sleeper, a table that seats 4, a chaise lounge and additional seating. 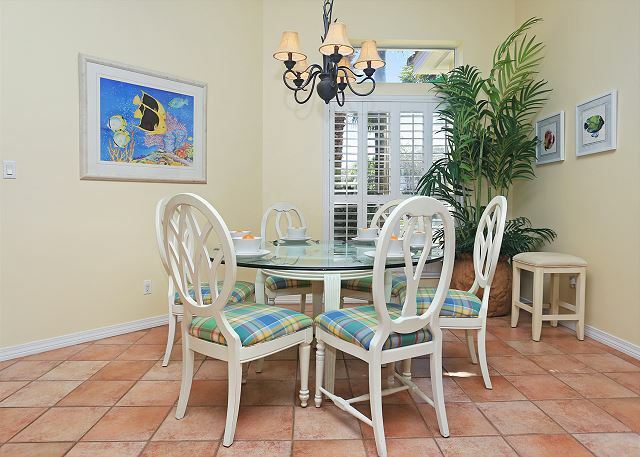 Enjoying this space will make it easy for you to see why the Mathee's chose this as their beach home. 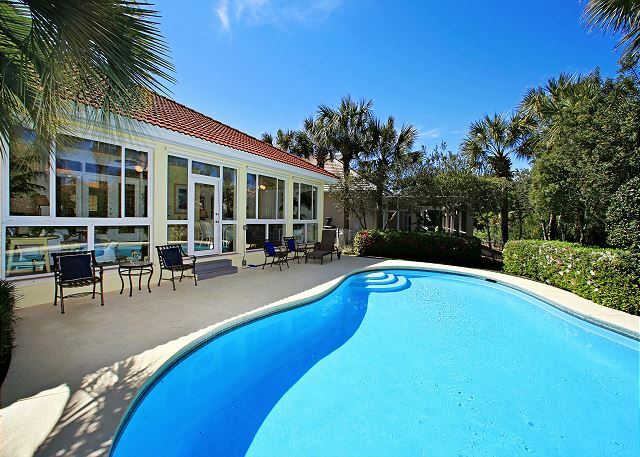 From the Florida room you walk out to the private pool which you are not going to want to leave! There is a gas grill so you can make dinner poolside. There are so many special touches here at Sunny Daze, you’re going to want to keep coming back year after year.